The Craftivist Collective launched their latest exhibition on Thursday 16th September 2010. The exhibition is installed at Paper Dress Boutique, a beautiful vintage clothes boutique, cafe and venue at 114-116 Curtain Road, Shoreditch, London EC2A 3AH. 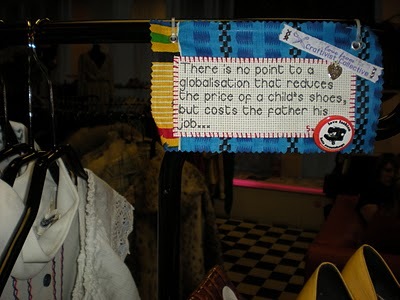 Mini protest banners by the Collective, on the subject of human rights injustices in fashion (specifically, child labour and sweatshop usage) are dotted around the shop, set against vintage clothes and accessories, sewing machines and displays. 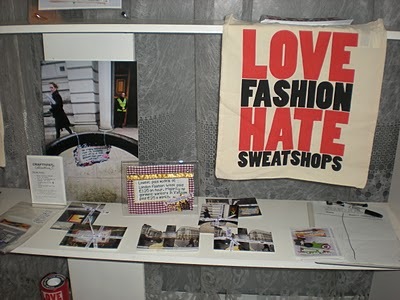 LOVE FASHION HATE SWEATSHOPS badges, stickers and petitions are also available to encourage shoppers and viewers to create positive change.